When you think of wine regions in the world, your mind is naturally drawn to countries like France, Italy, Spain, US, and even Australia. These are the big names in the business, so to speak. These are the biggest wine producers, have the best quality wines, and the best terroir. It’s rare to think of countries like South Africa, Portugal, and least of all Chile. But the South American country is gaining a formidable reputation in the world of wine making. It offers some very high quality wines that have drawn the attention of wine makers everywhere. Chile has a near ideal terroir that’s envied by the wine making countries all over the world. This is because it gets fresh water supply from the snow melts in the Andes in the east, and a temperate climate because of the Pacific in the west. If you’ll look at the map, you’ll notice that this country is a long, thin strip of land. The temperature at the northern end is hotter and drier, while the south is cold and wet. The best wine producing region is in the middle with temperature climate not dissimilar to the climate of California or the best wine making region in the world, Bordeaux. The Atacama is the farthest north and has two major wine producing valleys, the Copiapo Valley and the Huasco Valley. Compared to other regions, the wine production outside of Pisco Sour and table grapes is quite low here. The Coquimbo has three valleys, the Elqui Valley, the Limari Valley, and the Choapa Valley. This is the most profitable wine producing region in the north of Chile, producing great varieties of Syrah, Cabernet Sauvignon, and Chardonnay. This region has three valleys as well, the Aconcagua Valley, the Casablanca Valley, and the San Antonio Valley. 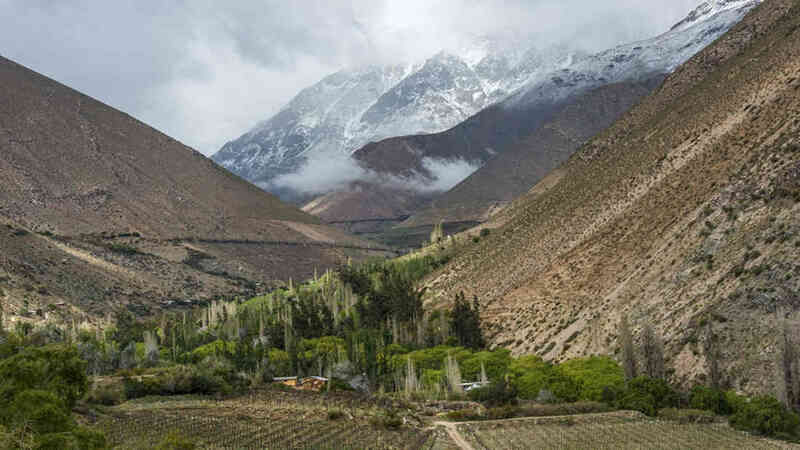 The Aconcagua Valley produces the renowned Seña red wine that’s made from grapes like Merlot, Cabernet Sauvignon, Carmenere, Petit Verdot, Cabernet Franc, and Malbec. The other two regions are known for their whites, producing excellent Sauvignon Blanc, Chardonnay, and also Pinot Noir. This region is, without a doubt, is the most successful wine producing region of this country. The famous Maipo Valley is in this region and is divided into Alto, Central, and Pacific Maipo. Alto and Central Maipo are known for their Cabernet Sauvignon, although central Maipo has also started growing Carmenere. The Pacific Maipo region produces Sauvignon Blanc. Also in the Central Valley Region is the Rapel Valley, which has the Cachapoal Valley and its Cabernet Sauvignon and Carmenere. The Colchagua Valley is known for its excellent and full-bodied Syrahs, Cabernet Sauvignons, Malbecs, and Chile’s signature Carmeneres. The third Central Valley Region is the Curico Valley is a known producer of Cabernet Sauvignon and Sauvignon Blanc. The Maule Valley is known for some of the best Cabernet Sauvignons and Carmeneres. This particular region is one of the oldest and the best wine growing areas in the country. The Southern Region has Itata Valley, which has more mass produced wines. The Bio-Bio Region is the most well known wine region in this end of Chile. It produces Pinot Noir, Sauvignon Blanc, and Chardonnay. Malleco Valley also grows Chardonnay and Sauvignon Blanc. Perhaps it’s time to explore the world of Chilean wines some more. For more information about unique wine storage solutions, you can call Signature Cellars on 02 9340 7515 or use this contact form to get in touch with us. We’ll be pleased to assist you.